Z-factor technical paper no 3: Ethyl silicate 40 as Binder in Mural Painting. The original text dates back to around 1977. It has been edited for this I-net publication. 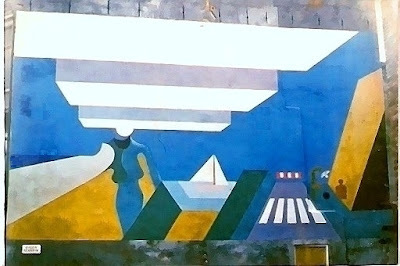 The author in 1974 designed and executed a 12 x 8 m2 outdoor mural in the city of Leeuwarden, Netherlands, using studio made paints having ethyl silicate 40 (E40) as binder. This probably was the first or one of the first uses of this medium in mural art in the Netherlands. A few years later he tested the same material in Lusaka, Zambia, when he was requested to submit a mural design for one of Lusaka’s high rise office buildings. E40 paint, though relatively unknown, has a number of superior qualities compared to other mural paints. It hence is an important addition to the small range of mural paints suitable for durable art work. The paint is best applied indoors. Outdoor lasting application should be under a canopy that protects from rain and wind. Ethyl silicate was first synthesized in 1846. Suggestion for the application of silicon esters for the preservation of stone objects and architectural structures was made in 1860 though it was not until 1923 that the first practical work was initiated by A.P. Laurie and G. King (1930, 1931a, 1931b). They set out practices for the use of silicon ester in stone conservation and mural painting. Presently a variety of silicon esters are industrially produced for applications in paints, investment casting and stone reinforcement. E40 is used as raw material that produces a colourless, hard, porous and inert binder for mural paints. The actual binder is silica (SiO2, sand is the most common form of this compound). E40 is a silicon ester that yields a high percentage of silica. The chemical bond between silica and ethyl alcohol is broken by hydrolysis. The silica turns into a gel which later becomes a hard, permanent silica film. The preparation of E40 paint in the studio is well described by R. Mayer (1982: 346-354) as well as its properties and application in art work. The paint, in brief, is prepared as follows. Pour 80 vol. units of E40 in a non-ferrous vessel and mix with 18 vol. units of ethyl alcohol and 2 vol. units of 95% (190 proof) hydrochloric acid (HCl). Agitate for twenty minutes and let stand for 12 hours. During this time E40 is partially hydrolysed, HCl acting as catalyst. Now add 5 vol. units of water. Hydrolysis should thereafter be complete in eight to twelve hours. This can be checked by applying a thin film on glass. The film should dry rapidly and craze when scratched. At this stage pigment and micronized mica must be added, roughly a quarter by weight of each. The simplest method is to add pigment and mica to the liquid while stirring with a stick. For this a plastic bucket with lid is quite suitable – as the paint should be applied soon after mixing. In industrial practice a ball mill is used ensuring perfect dispersion of particles in the liquid. Mixing is easy as the medium has good wettability and this is why the simple manual method yields acceptable results. The mica acts as filler and improves paint consistency – without it the paint is quite liquid and harder to handle. Once mixed the paint has to be used within 24 hours as the impending gelling and solidifying stages cannot be retarded. Gelling obstructs adherence. The silicon binder forms a porous, cementitious bond between pigment and support. The pigments therefore largely retain their natural appearance as there is no coating causing refraction of light. The resulting mat surface suits mural painting very well. The porosity allows the wall to breath and contributes to the longevity of the paint. Destruction of the paint is brought about by mechanical wear (as by rain drops or air born dust particles), deterioration of the support, improper application of the paint and possibly its inherent brittleness. As a plasticizer 2-4% polyvinyl butyral (vinylite XYHL) has been added. The paint sets within a few minutes and is dry to the touch within 24 hours. The entire “drying” process takes one to three months to complete. Prior to painting the proposed wall surface needs to be inspected. There should be no efflorescence or leakage; the surface should be intact, clean and not covered by paint or other film making substance. The surface usually is lime or cement plaster or perhaps concrete. All these are suitable. Normally a ground coat of white paint is first applied. This shall increase the luminosity of the work. Over painting can be done after a couple of hours. There is limited opportunity for wet-in-wet painting due to the drying speed of the paint. E 40 paint has to be applied thin and fresh. Thick and multiple layers have poor adherence and eventually flake off or crack. The paint is thinned with a mixture of one part E4o medium and three parts ethyl alcohol. Fresh paint can be wiped off with ethyl alcohol. Brushes must be cleaned immediately after use by rinsing in ethyl alcohol. The thoroughly dried paint film can be cleaned with water and brush. For permanent art work standard pigments have to be used that are both alkali and acid resistant. These are: titanium dioxide (white), the iron oxides or mars colours (yellow, reddish brown, black), chromium oxide (dull green), viridian (bright green), cobalt blue, manganese blue and caeruleum blue. Under less stringent conditions phtalocyanine blue, ultramarine blue and the cadmium colours (yellow-orange-red range) are also used. Note that the cadmium pigments are poisonous. Prolonged exposure to E40 is harmful to human health. Work and prepare paint in ventilated areas. Incidental skin contact is not particular harmful, clean with ethyl alcohol. Ethyl alcohol is flammable and poses a fire hazard. Presence of a fire extinguisher is advisable. Artists considering to work with E40 first should try the medium out by making small quantities of paint and applying these to concrete tiles, bricks or slabs. These should be exposed to outdoor condition once fully hardened. Test carried out by the author in Zambia demonstrated the strength of the paint: tiles exposed to weathering under adverse conditions for several years displayed remarkable durability though mechanical wear and tear was observed. Also the importance of applying the paint in thin layers was confirmed; thickly applied paint tends to crack or flake off. ut is fine for temporary work. Waterglass painting, also named Keim’s process after its inventor, like E 40 has a silica binder; however the process involves the presence of the highly reactive elements sodium or potassium. Fresco is the standard in the Western art mural tradition. The technique, however, is very laborious, requires considerable technical skill and experience, and is more rigid than E 40. E 40 is produced by Dynamit Nobel Aktien Gesellschaft and Union Carbide Ltd. Standard pigments have to be supplied from specialised houses, in particular those that only are used in artistic practice. Ethyl aLcohol and hydrochloric acid are procured from chemical suppliers. All can be googled up. * The author is an artist and cultural anthropologist working in Zambia. He produced several murals of which one in ethyl silicate 40. He is the founding director of the Choma Museum and Crafts Centre and organized several art exhibitions in Zambia. He publishes mainly on The Net; mostly in the Art in Zambia Blog, the Z-factor Art Site, Z-texts on line and www.academia.edu. Cogan, H.D. and C.A. Setterstrom. Properties of Ethysilicate. In Chemical and Engineering News, 24 (18), 25 Sept. 1946. Cogan, H.D. and C.A. Setterstrom. Ethylsilicates. In: Industrial and Engineering News. 39 (11), 1947. King, G. Silicon Ester Binder. In: Paint Manufacture, April 1931. King, G. Silicon Ester Paint Medium. In: Paint Manufacture, May 1931. Mayer, R. The Artists’ Handbook of Materials and Techniques. New York: Viking Press. 1982. Born 1944 in Amsterdam, NL; professional loves: art (imagery & writing), teaching, anthropology, development cooperation, organic agriculture, IT publication. In that chronological order with overlapping practice. © Zamfactor Ltd. for pages and posts by Z-factor. Quote freely with acknowledgement of source. Awesome Inc. theme. Powered by Blogger.